Elaine Hancock (Olney, United States) on 26 September 2016 in Transportation. I got home from the hospital about 10 days ago. I am in a wheelchair and have started to walk a little with a walker. I have on a long leg immobilizer. The knee implant remains out. It will probably be re-implanted in December or January when the doctors are sure that the infection is gone. I am still on intravenous antibiotics. I do see some small improvement everyday which is good. I have missed all of you. Thank you for your good wishes. It means a lot to me. I am going to try and post some old pictures that I have reprocessed to black and white. I hope to get on AM3 at least a couple of times a week to start out. This first image was taken in 2011. I changed it to black and white. You must feel like blowing off steam, too ! Good to read you have a program of recovery and wish you well. @Ronnie 2¢: Thank you Ronnie. Yes blowing off steam would probably be a really good idea some days! So pleased to see you back Elaine. I hope you will soon be better. 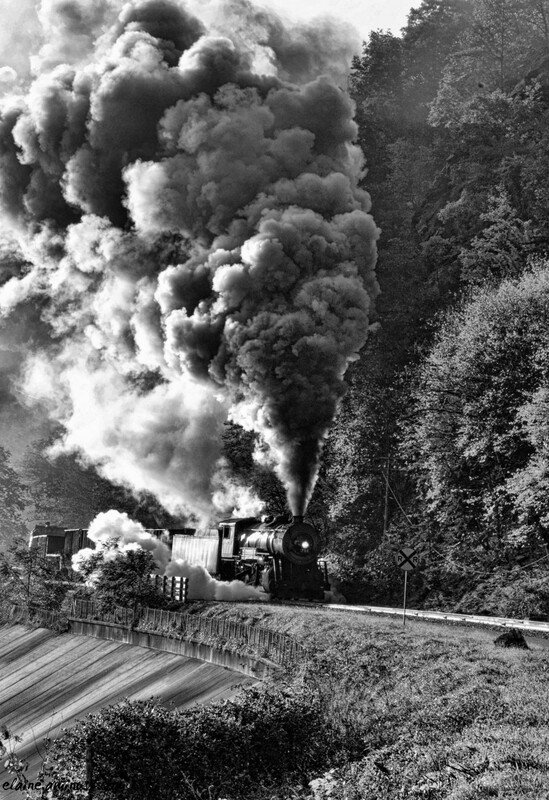 This is a superb B/W of a great old train. @Frances: Thank you Frances. I am glad to be back! Ça fume !!! Jolie capture. "Foncer à toute vapeur" est bien illustré ici ! Happy to have you back. Hang in there. Love this shot. And like Ronnie 2c said above, blow off a bit of steam...but keep it clean! @beach: Thank you! Just trying to take it a day at a time. What an enormous sense of power this large plume of steam evokes!! Glad to see you posting and wish you continued improvement!! @Steven: Thanks so much Steven! Stunning! Your train shots caught my attention a few years back ~ this is just awesome, love the composition! Great to see you here! @RBL: I am glad to be back Ruthie! ... and feeling better everyday! That's great to hear! @Carol: Thanks a lot Carol. Some days are definitely better than others. Just need to keep moving forward! Superb! the huge steam and smoke plume is fantastic - I can feel the power of the locomotive chugging along. Un n&b très puissant, une belle version. Contente d'avoir de tes nouvelles, je te souhaite beaucoup de courage pour la suite ! un splendide noir et blanc!! SO happy to hear you are at home. I have missed you very much! The B&W gives this a wonderfully timeless feel. Wishing you a good recovery Elaine. Good to see you Elaine.. The black smoke will soon roll away..